AT least eight people are dead and more than a dozen others injured after a terrifying vehicle attack in Lower Manhattan. 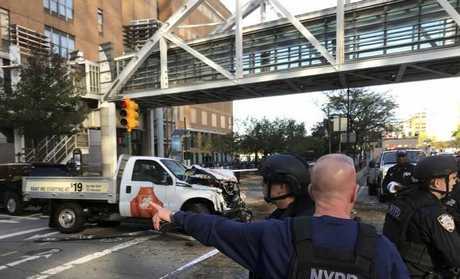 Police say a man mowed down multiple cyclists and pedestrians at the intersection of West and Chambers Street in Battery Park City near the World Trade Centre site at 3.15pm local time (5.15am AEDT). The New York Post reports the man shouted "Allahu Akbar" as he got out of the car armed with fake guns, sparking panic and confusion. Witnesses reported hearing gun fire but it now appears that was from responding officers, who opened fire on the attacker. "What happened was there was a car crash … he came out of one of the cars. He had two guns. He was running around Chambers and somebody started to chase him," said a 14-year-old high school student. "I heard four to six gunshots - everybody starts running." It appears the ute smashed into a school bus outside a high school. The man was taken into custody. The suspect is in custody. This is preliminary, more information to follow. Some witnesses said they initially thought the shooting was a Halloween prank. "We thought the guns were fake and it was a Halloween prank," high school student Laith Bahlouli, 14, told the New York Daily News. "There was a car crash, and then he started to shoot." "I heard four to six gunshots - everybody starts running," she added. Video from the scene shows at least people lying limp in the street. Photos show a smashed up Home Depot rental utility vehicle. The number of casualties is currently at 15. Witnesses described a scene of terror, saying the shooter ran over two people before ploughing into a school bus. "Jesus! A car just ran over 2 people and then crashed into a school bus. 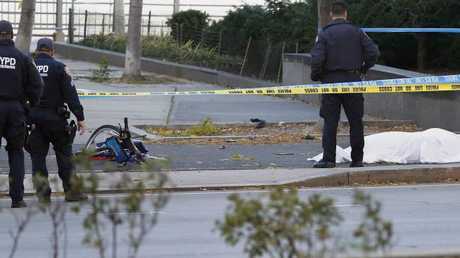 I see two dead bodies and citibikes on the floor destroyed," one Twitter user wrote, according to the New York Post. 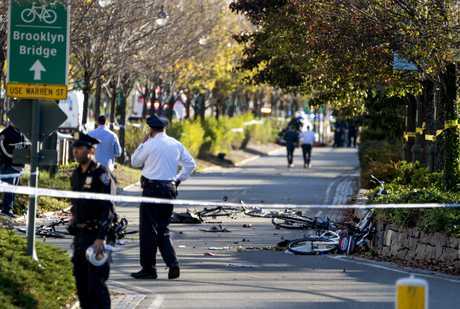 Acting Prime Minister Julie Bishop says Australian authorities are monitoring the developing situation in Manhattan. "It is an unfolding situation and our thoughts are with those who have been affected by this tragedy," she said on Channel Seven's Sunrise program. "We will obviously keep people updated. "Australians in New York and in the vicinity should follow the advice of local authorities and contact our consulate hotline if they have any concerns. "Obviously, if you're worried about friends or relatives or love ones in New York, please make sure you try to contact them and if you're unable to do so, then call our departments of foreign affairs hotline." 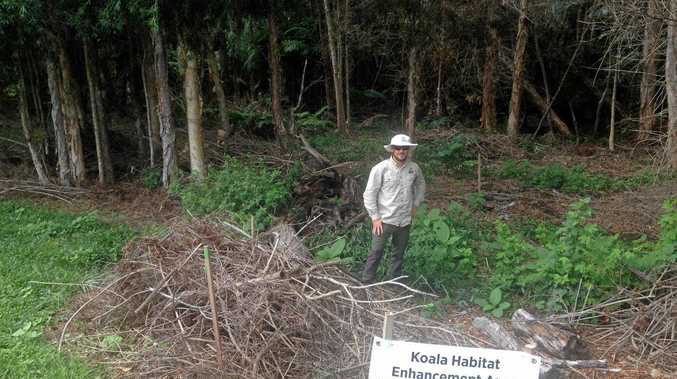 News ACTIONS are being taken to strengthen koala populations on the Mid North Coast through work on green corridors in the area and you can play a role too.